and myself at the Riviera Gallery. Curated by the awesome Servicio Ejecutivo. 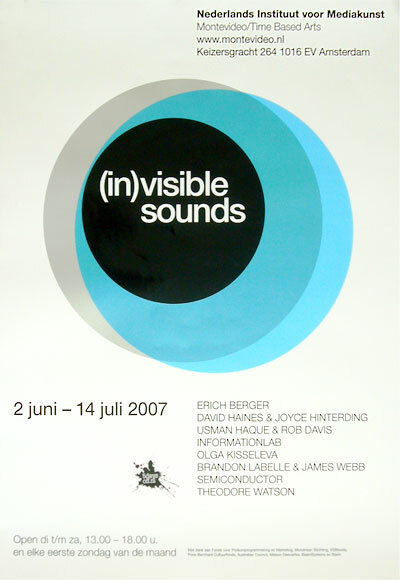 Audio Space is currently being shown at the excellent <TAG> gallery in the Hague. The show which focuses on Augmented Reality has a lot of really interesting work. would be nice to make something to feed their brain. I built a series of tools to programatically create graphics which Emily would use as building blocks for the worlds she designed. elevation map of the moon are much more subtle. The project was commissioned for the excellent Servicio Ejecutivo gallery, see project page here. All the software was built with the latest version of openFrameworks. See more images here: phttp://zanyparade.com/v8/projects.php?id=17. A limited edition of posters will be printed and for sale soon. IDN recently featured some of my work in the Pick of the month section of their excellent Creator's id issue. They also included the Funky Forest installation and Science of Sleep show on their DVD. Check it out, in stores now! Following MoMA where else but the TATE Modern? Good old English weather prevailed but not before we managed to throw up some tributes to London's ultimate phallic symbol. GRL strikes again and again. Crazy I know but Laser Tag is part of quite awesome Design and The Elastic Mind exhibition currently showing at MoMA. Coincidentally (???) I was asked for interviews by two Japanese online magazines with a couple of weeks of each other. They are both spectacular publications and I really enjoyed trying to answer the questions they posed. 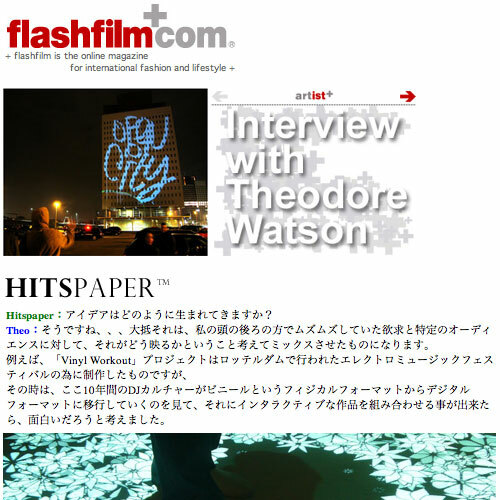 Flash Film Interview and: HITSPAPER! Alright finally - it is here. Laser Tag 2.0 Mac and PC version. 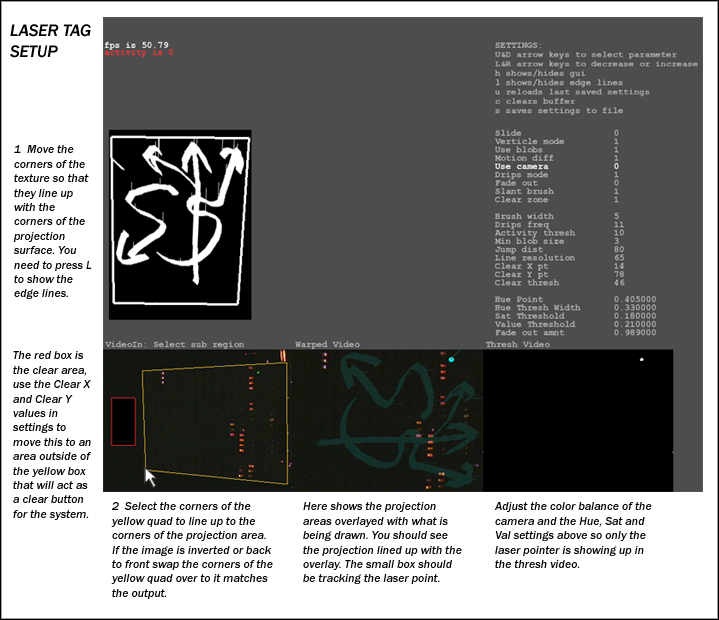 Laser Tag 2.0 is a Graffiti Research Lab project and is written by Theodore Watson and Zachary Lieberman using openFrameworks. It may be used free of charge as long as it is not used for marketing, advertising or promotion and especially not for lame guerrilla marketing events! - 4 main brush modes - each with their own qualities and different brush types. - You can design your own brushes by making png files. - If you want to code your own brushes there is a super simple system for that too. - Built in music player for playing your party jams while Laser Tagging. - Network connection for sending the laser tag data to flash, Processing, openFrameworks, Max / Msp etc. 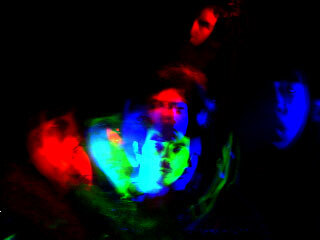 - Color! - editable color xml file - add up to fifty brush colors - works with all brushes. 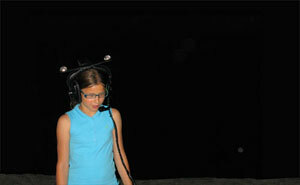 Here is the essential equipment you will need for your Laser Tag system. 1x fast laptop (PC or Mac) that can connect to an external monitor. It helps if the laptop has a dedicated graphics card, so a Macbook Pro would be preferable to a Macbook for this reason (though macbooks seem to run it just fine!). 1x video camera that you can connect to your laptop. Video cameras that have manual controls tend to be a lot better at tracking the laser than ones that automatically adjust the image depending on how bright it is. 1x projector. Anything over 2000 lumens should be good. 1x laser pointer between 5mW and 80mW in power. For this setup we are using a Asus F9S laptop with a Logitech Messenger camera, a Benq 2500 lumens projector and a 70mW green laser pointer. This is fine for a small setup but for larger scales you will need a brighter projector and a better camera. PC - The Laser Tag software is setup to work with the projector acting as an extended desktop to your laptop's main display. If you have a PC laptop and an NVIDIA graphics card you need to set your display to use horizontal span mode (or extended desktop) and set the total display dimensions to 2048 by 768. If you don't have horizontal span look into Realtime Soft's Ultramon which works with all graphics cards. To effectively track the laser we need to disable the camera's Auto White Balance, Auto Exposure and Backlight Compensation. In the Laser Tag software hit the 'C' key to bring up the camera settings box. Go through the settings box and set as much as possible to manual. Now we are ready to align the camera and the projector. Run the Laser Tag software and hit the 'F' key to enter fullscreen. Now hit the spacebar to show the edges of the projection area. With your mouse drag the corners of the white projection quad so it fits onto the surface you are projecting onto. Hit the 'S' key to save your settings. In the top left corner you can see the video panel of the camera. Make sure that the camera is covering the whole projection area and is in focus. If you can see the four corners of the projection quad with the camera then just drag each corner of the yellow camera quad so they line up. If the camera image is too dark to see the corners of the projection quad then have a friend beam the laser at each corner and drag the corners of the camera quad that way. Hit the 'S' key to save your settings. In 'Tracking settings' start off with saturation at 0. See if you can distinguish the laser just by adjusting the brightness (value) threshold alone. Note: Reducing the brightness in the camera settings (see step 3) to the point where only the laser is visible can make the this step much easier. If you are still seeing a lot of white noise in the tracking panel try using the 'Sat Threshold' to track by colour as well. Hit the 'S' key to save your settings. At this point adjusting your camera settings to make the image as dark as possible but the laser still bright will make tracking a lot easier. 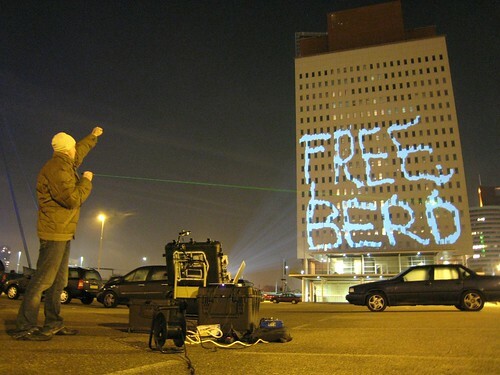 Notice how in the above image the laser is isolated from the projected image even though the camera can see the projected 'paint'. You can always hit the 'D' key to clear the projection manually but it is more convenient to set up an area as a button that clears the projection when hit with the laser. You can enable the clear zone in 'Clear zone settings'. The clear zone shows up as a red box in the video panel. Adjust the x, y, width and height properties to position it somewhere outside of the projection area. 'Brush mode' allow you to change the type of brush you use. There are four basic brushes: The pngBrush, the graffLetters brush, the vector brush and the gesture brush. The pngBrush uses user created png files to draw with. Use 'Which brush image' to switch the image used and 'Brush color' to change the drawing colour. You can add your own png brushes to the app by saving them to the data/brushes/ folder and you can edit the /data/settings/colors.xml file to add colors. The vector brush also has a bunch of different styles - check the fat style bellow. For ultimate realism enable drips in the 'Drips settings' to make drips come down from your tag as you are writing. You can also adjust how drippy and the speed of the drips with the other drip settings. Have fun! For framerate improvement: try tracking without advanced quad. Stay tuned for the full video tutorial live from Lausanne! Besides the evil Laser Tag 2.0 system we were running at Ars Electronica, there was also some work from the students of my New Forms of Storytelling class on show. The assignment was to make a complete alphabet out of animated gifs and then send me the message they want to display to the people of Linz. UPDATE: !!!!! LASER TAG 2.0 IS RELEASED !!!!! on the PC sending the data over to a Mac to display the lines. So one of the things I was invited to do at the Barcelona OFFF festival this May was to work with Zachary Lieberman on a performance called 'Liners'. The performance was a about the story of a never ending line told through animation and video. We sent out a call for short videos of a line being drawn from one side of the video to the other. We then wrote software to track the lines and connect the videos together to create the live performance. 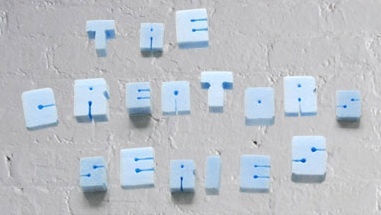 From the guys that brought you RES FEST, The Creators Series is a new kind of arts event. The events are designed to examine the future of creative culture, and its impact on the rest of the world. Theyâ€™re meant to be fun and interesting, consisting of a multimedia gallery with work from all the creators thatâ€™s open to the public all weekend long, as well as ticketed presentations, discussions, and music performances, plus the odd party thrown in here and there. I will be showing Vinyl Workout and a new version of Daisies. Please come down and check it out it should be a lot of fun and the exhibition is completely free! Check the video bellow for eary Daisies 2.0 hotness! The next version of Audio Space is up and running at Montevideo (Amsterdam) as part of the (in)visible sounds exhibition. that float at the spot that they were made, even after you have left the room. Zach Lieberman and myself are working on a brand new performance for the opening night of OFFF. 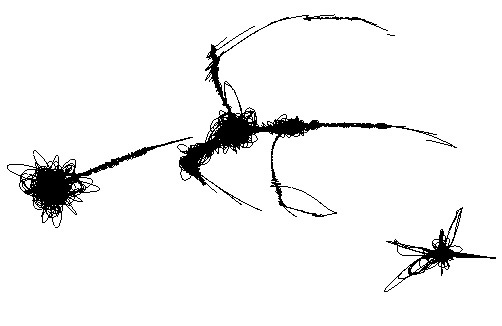 animation of a single line. of the performance. Think of it as an easy way to show how creative you can be with a few seconds of video. Deadline is Wednesday 9th May - so be quick!!! New videoInput released - loads of new stuff! that lets you configure and capture multiple cameras and capture devices with ease! -Much much cleaner - trust me you want to use this one!" but it was half the exhibit so it turned out quite okay in the end. 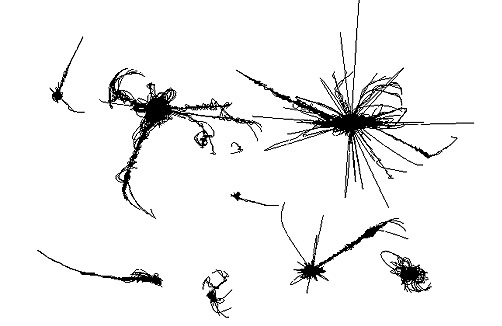 Some drawings from some of the first software I made. You create small particles that relate to each other using the gravitational inverse square law. and the lines you see shows the paths they take due to the force. multi-channel photographs out of slowed down incoming video. Reminds me of old 60's posters. damn huge and can be seen from far around the city. You can see the final video from the show on the Graffiti Research Lab website. -1 Black pixels means the lights are on white pixels means that they are off. 1 You can convert either a quicktime file named input.mov or an animated gif named input.gif. 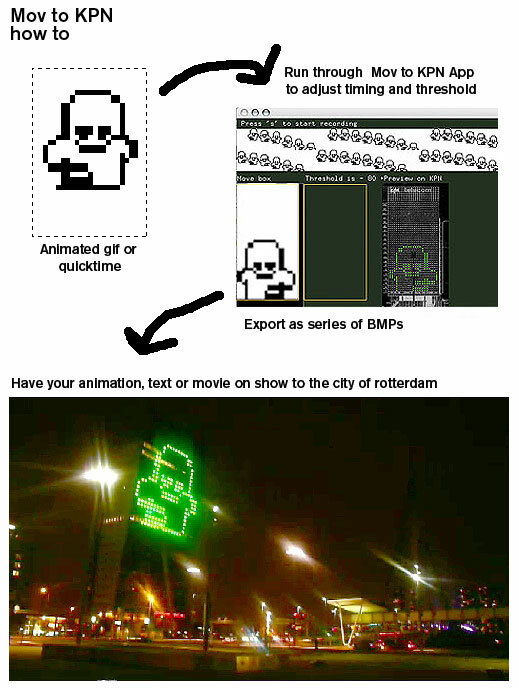 2 If the gif/mov is larger than 22 by 41 pixels then you can use the yellow box to select a subregion of the image. 3 The + and - keys adjust the threshold for what is considered black and what is white. 4 The facade has a framerate of 4 frames per sec hit the f key in the app to simulate that speed. 5 S starts and stops recording the frames to disk, the screen will flash red once the end of the sequence is reached. 6 The frames that are outputted are stored in a folder called frames. 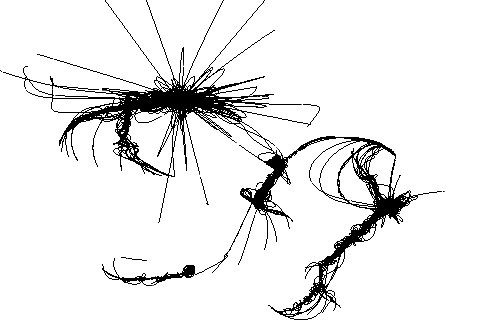 written in C++ using openFrameworks, which is a processing like api for writing creative code. 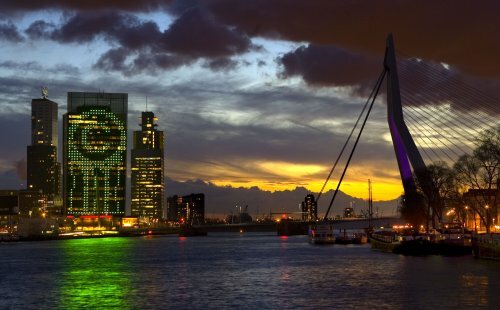 Laser Tag a building in Rotterdam tonight! at the opening of the Art Rotterdam festival. 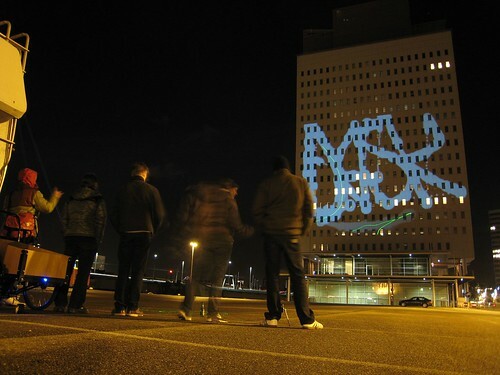 6 and 10 to try your hand at 150 foot high digital graffiti. We are the hokey looking RV out in the middle of the parking lot with a bunch of lasers coming from it. 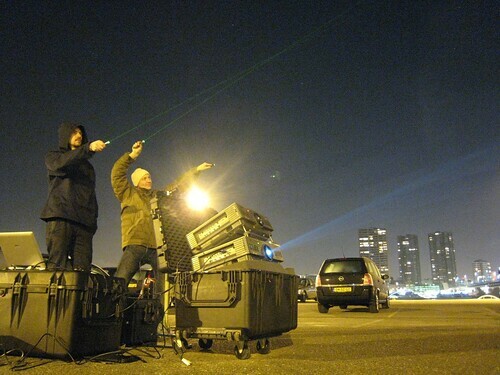 Laser Tag will be up every night till the 11th of Feb.
James for the Art Rotterdam fair. Here is a little teaser picture from our first night of testing. Just got back from setting up the Michel Gondry show in Milan. This one I think is a lot nicer as there is more space and I had some time to make little adjustments to the code as well. I was asked to show Dasies at the Blend Store in Amsterdam for their Museum Night event in November. Here is a short video from the event. These are some videos from animation software I worked on at Eyebeam that was meant to allow children to draw and animate in a fluid natural way. So for the last month I have been working on four installations for Michel Gondry's Science of Sleep exhibition at Deitch Projects Soho. The opening was last wednesday and it was insane. There were people queued up 3 ways around the block! 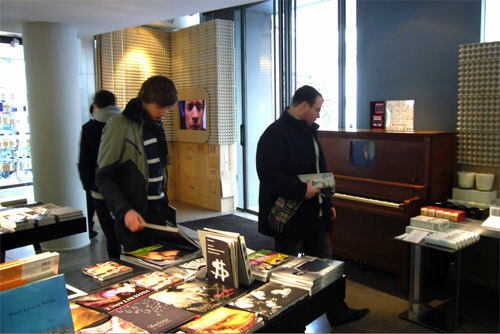 An interactive piano that plays back video clips of people playing the note you pressed on a different piano - kind of hard to explain - but cool. A cardboard working camera that does realtime chromakeying. 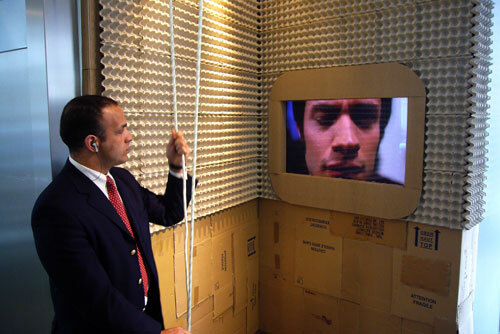 A piece where you pull the eyes of the actor open by pulling on ropes. An HD video on two massive LCD screens designed to look like windows - with the lights in the space reacting to what happens in the video. 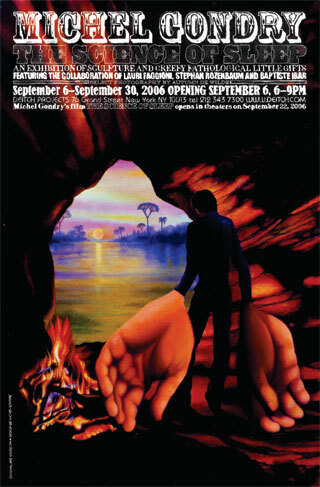 The show is up till the end of September and is free! 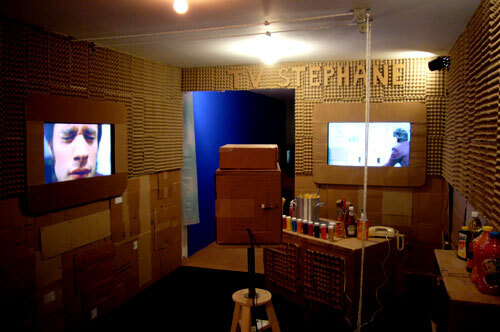 The bluescreen camera and rope controlled eyes piece, minutes before the show opening. Just released version 5 of muonics.net - the idea was to get rid of a lot of the structure of the old site and instead let the work do the talking. Hence large images, quicktimes and little else. You can still reach the old site in the archive link above. A new version of my interactive sonic environment 'Audio Space' is on show at Eyebeam as part of their summer exhibition. 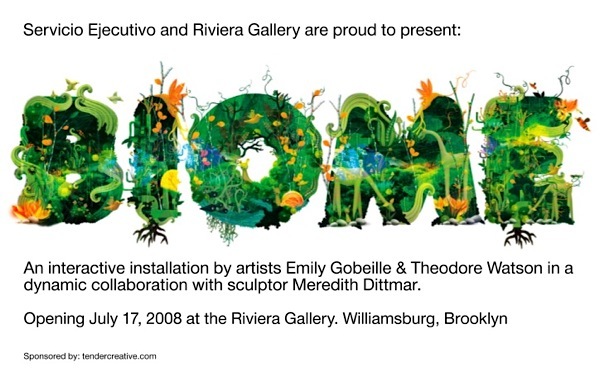 The show is up till July 15th - so come check it out - it is my favorite version so far. The piece now generates tones based on your voice so that the experience is much more musical. Moving around the space you choose both spatially and temportally how you hear the piece. Emily and I put together a protoype for a future kids mobile phone based puppet show called How To. It features two puppets Icky (a snake) and Orzo (a mad scientist) this is an outake music video made by www.zanyparade.com about the puppets secret love. You can see the real submission here. Zach ( http://thesystemis.com ), Evan ( http://ni9e.com ) and I taught a workshop on openFrameworks at Eyebeam the other week. OpenFrameworks is a free, cross platform, openGL based api of sorts for doing cool creative stuff in c++. The workshop was like two semmesters of classes crammed into 3 days. Day 1 was a general intro to c++ with examples. Day 2 was animation techniques and examples. Day 3 was computer vision with and without openCV. This was all the mac projects as that was what people were using - though it would work fine on a PC too. Oh you need xcode 2.2 or above!!! 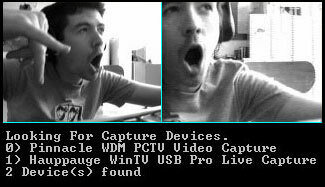 This is some free software I wrote to make video capture into a c++ application nice and easy. It can handle webcams - capture cards and the super high res pixel link cameras. Currently precompiled for Codewarrior on a PC but it can and has been compiled for devC++ and Visual Studio too! So after a little bit of frustration with having nowhere to post useful tools and ramblings I decided to make this news page. I will post loads of useful code and friends work too.